Need some travel inspiration to get you through the day? Here’s a throwback of the red beauty posing in the city of Nawabs, Lucknow. Comment with a ‘❤’ if you love the royal red of the Ford Mustang. 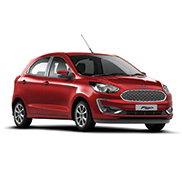 Ford manufactures and exports vehicles and engines made at its integrated manufacturing facilities in Chennai, Tamil Nadu and Sanand, Gujarat. Since its entry in India in 1995, Ford has invested more than US$ 2 billion to expand its manufacturing facilities and sales & service footprint to meet demand in one of the world's fastest-growing auto markets. 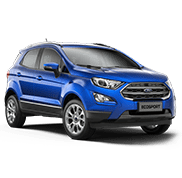 Ford India’s integrated manufacturing facility at Maraimalai Nagar, near Chennai, produces its award-winning range of products including the Ford EcoSport and Ford Endeavour. As part of its overall commitment, Fo d inaugurated its US$ 1 billion state-of-the-art integrated manufacturing facility in Sanand, Gujarat in March 2015. With Sanand being operational, Ford India has doubled its annual installed manufacturing capacity to 610,000 engines and 440,000 vehicles. 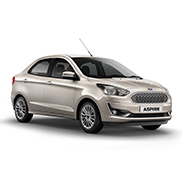 The sub-four-metre compact sedan, Ford Figo Aspire, became the first car to roll out from the new Ford Sanand plant. The plant also manufactures new Figo hatchback. 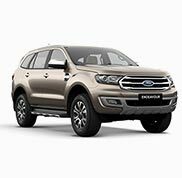 Ford’s biggest-ever product line-up in India today offers a vehicle to suit the needs of nearly every consumer. In 2016, Ford has also given Indian consumers their first opportunity to own the iconic Ford Mustang. 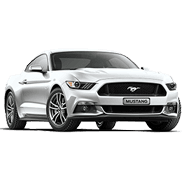 Debuting ahead of the Delhi Auto Expo 2016 and set to hit Indian showrooms later this year, the new Mustang is all set to bring the world-class performance and refinement of Ford’s iconic pony car to India’s roads. 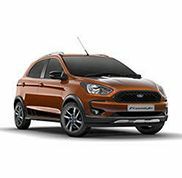 As part of its strategy to Make in India for India and the World, Ford continues to strengthen India as a center of excellence for small cars and low displacement engines. The company has embarked on an accelerated export strategy and presently, exports Figo, Aspire, and EcoSport to over 40 markets around the world. Along with introducing new products, Ford continues to grow closer to customers with the continued expansion of its nationwide dealership network as well as world-class after-sales offerings. Presently, Ford has more than 376 sales and service outlets in 209 cities across India. To enhance affordability and accessibility, Ford has introduced many pioneering initiatives that reduce the cost of ownership including the Sub-assembly of parts, Pan-India Roadside Assistance, and Mobile Service Support. To ensure total transparency in service costs, Ford also introduced a unique Service Price Promise, which allows customers to calculate the vehicles’ periodic maintenance costs even before booking the service at the dealership. Ensuring customer convenience, Ford has expanded the availability of Ford Genuine Parts with the appointment of distributors in Maharashtra, Goa, Karnataka, Kerala, Delhi, Tamil Nadu, AP, and Telangana. 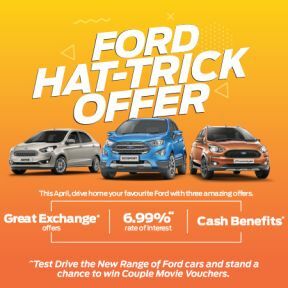 Ford’s presence in India includes Ford Credit India, which started dealer wholesale inventory and retail financing in 2015 as a non-banking financial company. With five decades of global experience, Ford Credit’s operations span in as many as 100 countries where it has emerged as a preferred automotive financier for both Ford customers as well as dealers. Ford Credit is known for its reliable and transparent loan products at competitive rates, flexible terms, and outstanding customer service. Continuing to generate employment and help the economy, Ford’s operations currently employ more than 14,000 hard-working, dedicated men and women across its operations in India which also include Global Business Services, with offices in Chennai, New Delhi, and Coimbatore. Registered as Ford Motor Pvt Ltd. (FMPL) as a legal entity, Global Business Services provide innovative solutions to nearly every Ford locations around the world in areas of Information Technology, Product Engineering, Finance and Accounting, Automotive Financing, Material, Planning & Logistics, Marketing Sales and Service, Analytics, and Purchasing. Driving innovation from India, Ford recently announced plans to build a new global engineering and technology center in Chennai. Besides the establishment of a global engineering and technology center, the new Ford campus spread across 28 acres will host operations of Ford Global Business Services in areas of IT, Product Engineering, Finance and Accounting, Data Analytics, Manufacturing among others. Ford’s commitment to India is not just business centric. At the heart of our business plans are people and communities. Going further with its Better World philosophy, Ford India in association with Ford Motor Company Fund announced ‘Operation Better World,' with the endeavour to address issues related to Education, Sustainability and Auto Safety around communities where it operates.